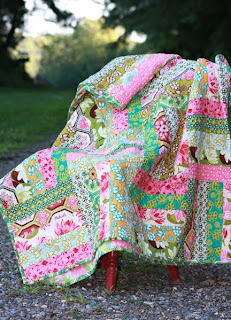 Wow - is it just me, or is this quilt GORGEOUS??? I love the beautiful vintage look of it, even though it's brand new! Something about a quilt that looks old...just seems right in the world! For a chance to win this beauty, hop on over to the Old Red Barn Co. and throw your name in the hat - and hurry - the contest ends at midnight, July 22 - that's tomorrow! So get to it!